Rock and Roll Hall of Fame bassist Prakash John is an old school advocate, a perspective whereby discipline and reliability are virtues, attention to detail matters and performing to the highest standard is a duty. That mind set has followed him like a second shadow across half of the world and held steady through many bands. Born in Mumbai (Bombay), India, John was introduced to ethnic, Western classical and church music and learned the violin, piano and sang in the choir. He was 13 when he immigrated to Canada. By chance, John heard R&B legend Ray Charles on a Buffalo, New York radio station. "I don't think the hair on the back of my neck has stood down since." he says. "I was hooked." Timing, the 1960s and location, Toronto's Yonge Street and Yorkville district, were key. Buddy Guy, Junior Wells, David Clayton Thomas and Joni Mitchell, you could hear them all. Black music, white music, the amount of melanin in your skin and the genre of music you performed were inconsequential. "Back then, you played and you proved yourself every week," says John. "Nobody segregated the music. It was either good or it wasn't." Witnessing first-hand the command that James Brown had over a band and an audience at Maple Leaf Gardens and mesmerized by great bassists like James Jamerson (Motown), Larry Graham (Sly & the Family Stone) and Verdine White (Earth, Wind and Fire), John picket up the instrument at 17. He quickly became a respected player around Toronto with bands like The Trikq, Mandala and Bush. In Los Angeles, John plucked and spanked four strings with Edgar Winter and Rick Derringer (White Trash) and Bobby Witlock (Derek & the Dominos). His career moved further upscale when George Clinton recruited him in 1971 for his Parliament/Funkadelic outfits and finished off the decade recording and touring with Lou Reed and Alice Cooper. 1979 brought John full circle to his Canadian musical origins where he formed his dream R&B band, The Lincolns predicated on the late 1960s sound of Yonge Street and Yorkville that had so enthralled him. "After I finished my stint with Alice, I came back to Toronto and I thought, "I've always wanted to have a really kickin' '60s R&B band" because that's my background," recalls John. "I formed a great band. I was blessed with some tremendous players over the years." The Lincolns have released two albums, Take One and Funky Funky Funky. They appeared on the CBC television special Live at the Astrolabe (1987), played at Wayne Gretzky's wedding (1988) and were part of the musical production Simply the Best (2016). 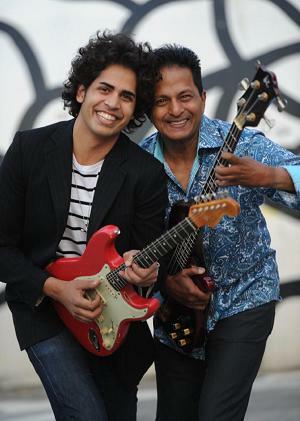 Recently, Prakash has collaborated with his son Jordan laying down bass lines for Jordan's band The Blues Angels while Jordan reciprocates supplying vocals and guitar for The Lincolns. Band members have come and gone but John's vision and commitment have never flagged. He pilots an airtight ensemble consisting of the finest musicians available, classic instrumentation of a Telecaster guitar, Hammond organ, horns, Fender bass and funky drums and visuals that strut co-ordinated dance steps.